I can’t just buy furniture for the nursery and then hope it fits. I also had a budget that I wanted to stay under and a plan was necessary to stay within that budget. As with my home redesign and redecorating projects, I like to draft up the room layouts in WORD with a scale and go from there. I know – it’s a weird OCD thing. The nursery was no different. I drew up a rough line drawing from the top bird’s eye view of the nursery in Word and decided on my color choices. I didn’t want to go with ‘baby blues’, but I do love the blue variation of turquoise. Our gender reveal party was turquoise, lavender, and grey chevron, so the nursery colors would be grey and turquoise. Donny didn’t think lavender was manly-enough to make the cut. We went with the overall theme of Big City Ninja. I knew I wanted the cute Wee Ninja guys from Ninjatown to be tastefully incorporated into the room once we found out he was a HE. I don’t play video games, but after googling ‘ninja’ and finding these guys, how could I say no? 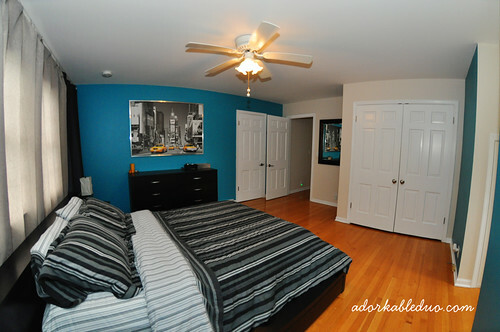 We were able to keep the turquoise walls as they were and just repaint the clean linen walls to a dark grey. I had nowhere else to use the Yellow Cab art, so done deal. That’s where the crib was going to go according to my full scale layout. Full scale? Yes. I spent part of an evening with a sketch of the layout and a tape measure to define my space. Then, I took those dimensions, in inches, divided them all by 20 for a 1/20th scale layout and drew the lines in Microsoft Word. When you draw a line in Word and then double-click on it, you can manually change the height and width of the line to the scaled number. For the design elements, I focused on 2D scaled sketches. 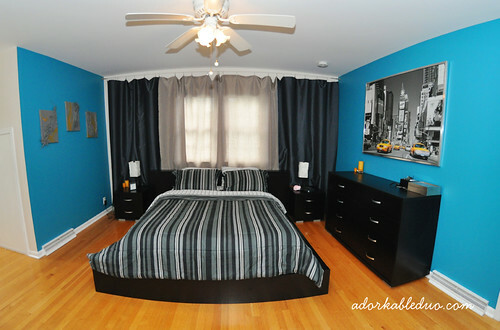 I wanted the far wall that you see when you first enter the room to be the focal point. I hand-painted panels for our wedding and wanted to do the same for the nursery, so I drafted up a scaled wall and calculated that I needed to paint three panels. I also wanted some cool storage and bench seating to line the bottom of the window, so I calculated that two Ikea 5×1 Expedits would fit perfectly along that back wall. The wall to the left of it was another blank slate. I wanted a library that wasn’t just standup book shelves, so again, I went to the Ikea website and found the Ribba wall ledges. They were white which would pop against the turquoise wall and a nice way to display the childrens’ books as art & decor. With all of that planning, it was easy to calculate that I would be under budget with the main furniture pieces. Happy with that, we started collecting and ordering furniture which took about two months to fully receive. Come back for more details!